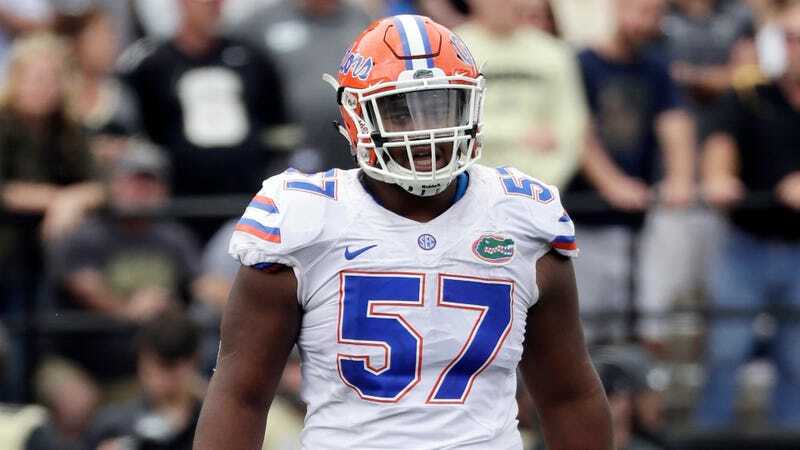 Former Florida defensive lineman Caleb Brantley has been charged with misdemeanor battery after striking a woman in the face and knocking her unconscious. A Gainesville Police report obtained by Ian Rapoport of NFL Network reads that the “use of force was clearly out of retaliation and not self-defense.” It additionally notes that the intensity of force “far exceeded what was reasonable or necessary” and that the woman suffered a displaced tooth which will require a root canal. According to local CBS affiliate WTSP, the fight occurred around 2 a.m. Thursday morning. The woman told police that she struck Brantley first, under the impression that he “disrespected” her. Most mock drafts have Brantley going in the second or third round.